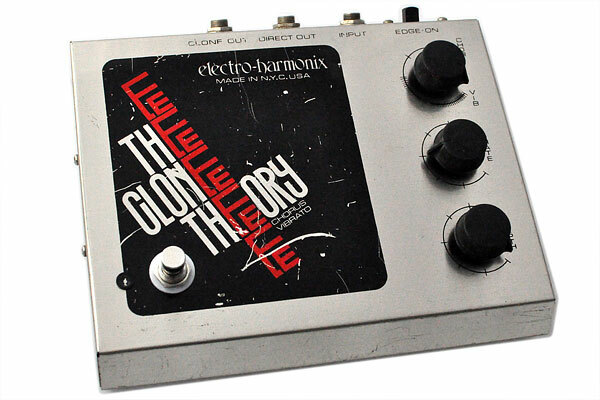 The EHX Clone Theory chorus and vibrato pedal is one of those pedals which we rarely see but those who use it will swear by it. The setup of the pedal is very similar to a vintage Deluxe Electric Mistress and can share some of the same mods. This one specifically was converted to true bypass, had an LED installed to indicate when the pedal is active, had an upgraded input buffer, and a boost at the output to increase the overall volume from the pedal. One other change that we made (and the reason for this blog post) was to mention that this pedal can be converted from the 110V AC plug to a 24V DC power jack as used by the Deluxe Electric Mistress. This is a great option for those of us with pedal power supplies which do not have an auxiliary power output. As always I advise upgrading the aging electrolytic power filter caps to ensure the pedal will continue to function properly.